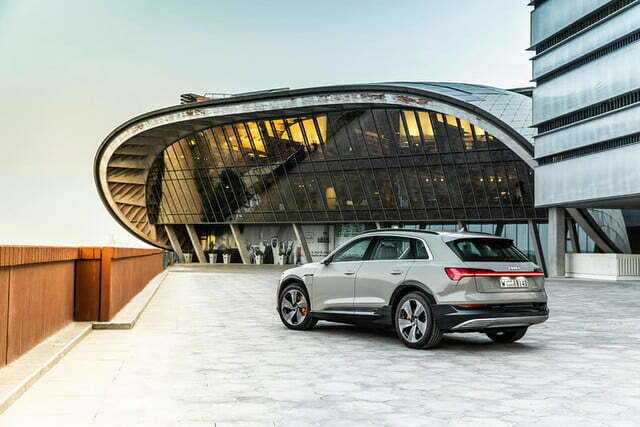 The Audi E-Tron is a luxurious, high-tech, and quick SUV that just happens to not have an engine. We’ve waited a long, long time to drive the battery-electric 2019 Audi E-Tron. We saw the first camouflage-clad prototypes in March of 2018 at the Geneva Auto Show. We went behind the scenes in Berlin to learn about the intricacies of its battery pack. We took a ride in one down Pikes Peak in August, shortly before the SUV made its global debut in San Francisco, and we drove a pre-production car through the Namibian desert several weeks later. What a trip it’s been. Why the long ramp-up? Simply put, the E-Tron is one of the most significant cars in Audi’s history. It’s the model that points the way forward in terms of electrification, design, and technology. It’s five years in the making, and there won’t be time for a do-over if Audi doesn’t stick the landing. At launch, Audi will offer two versions of the E-Tron named Premium Plus and Prestige, respectively. 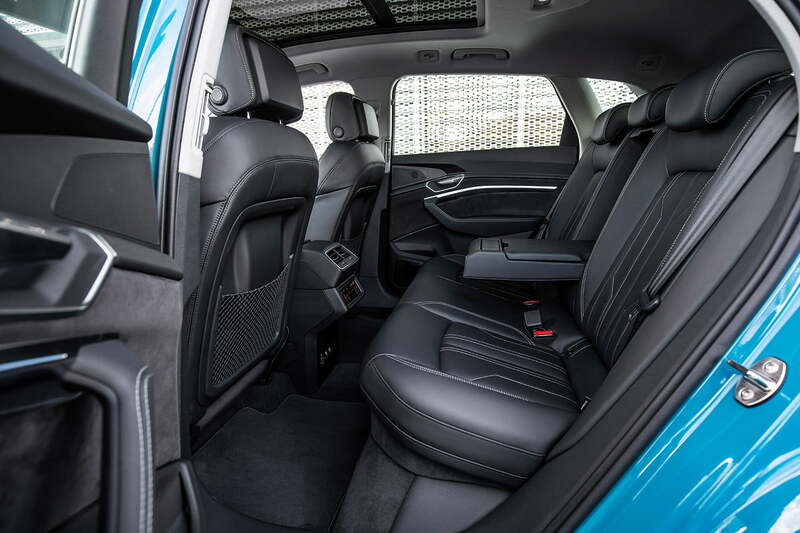 Priced at $74,800, the Premium Plus trim level comes generously equipped with 20-inch alloy wheels, a top-view camera system, the company’s side assist technology, LED lighting inside and out, a 705-watt sound system that blasts music through 16 speakers, 12-way power-adjustable seats, and a 9.6-kilowatt on-board charger. Buyers who select the $81,800 Prestige model benefit from a head-up display, sunshades for the rear windows, traffic sign recognition technology, lane assist, Valcona leather, and dual-pane acoustic front side windows, among other features. Note that the aforementioned price figures don’t include any of the available federal and local incentives awarded to motorists who go electric. Since the E-Tron is Audi’s first series-produced electric car, buyers will be able to claim the full $7,500 federal tax credit in the foreseeable future. The company won’t begin to lose that amount until it puts 200,000 cars in the hands of consumers. 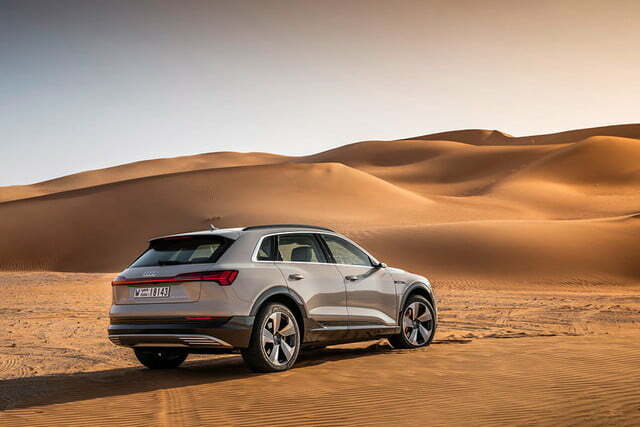 When they started the E-Tron project, Audi’s engineers and executives immediately agreed on two important points: the model needed to be entirely electric, and it had to compete in the SUV segment. That meant engineers couldn’t take a shortcut to electrification by adding a range extender, Chevrolet Volt-style. It also meant they had to figure out how to maximize range; trying to make an SUV aerodynamic is a little bit like trying to brew a coffee that helps you sleep. 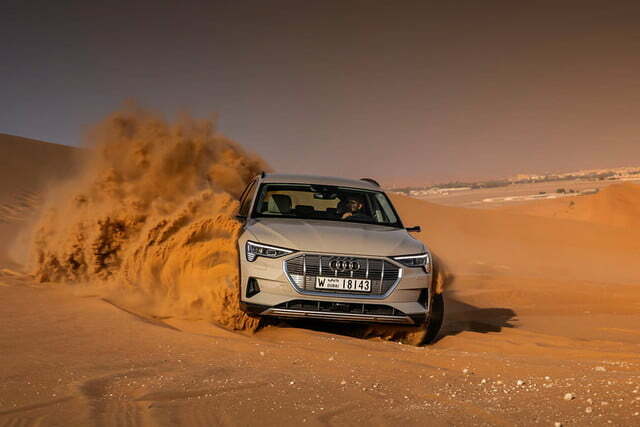 Johann Wagner, one of Audi’s aerodynamics experts, told Digital Trends that several key design cues helped his team achieve a low drag coefficient of 0.27. The inlets chiseled into the front bumper direct air past the wheels. The shape of the mirrors reduces drag, as does substituting them for cameras when permissible (more on that later). The 19-inch alloy wheels are aerodynamically optimized, too. 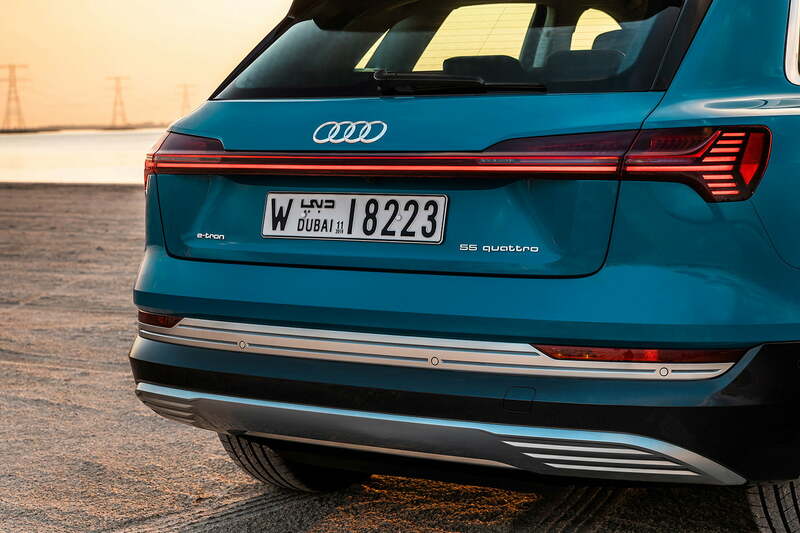 The adaptive air suspension automatically lowers the E-Tron’s ride height at higher speeds, while a pair of plastic louvers hidden behind the grille stay closed when additional cooling air isn’t needed. Finally, the fully enclosed underbody helps air slip past the E-Tron rather than getting caught in every imaginable nook and cranny. All told, these tweaks – and they all sound fairly minor, right? – helped boost range by 21 miles per charge. Audi wanted to create a great car that’s electric, not one whose only selling point is its battery. And yet, although it cheats the wind, and many of its design cues are futuristic, the E-Tron doesn’t break the mold. It’s recognizable as a member of the Audi family thanks to its sharp headlights and its hexagonal grille. It’s not shaped like a spaceship, and Audi wisely refrained from adding the seemingly obligatory green (or blue) trim pieces that say “oh, look, I’m gas-free!” The story is the same on the inside. The E-Tron is luxurious and built with upmarket materials, like the company’s other SUVs, but you don’t know it’s electric until you press the button labeled “start” and you don’t hear a six- or a four-cylinder engine rumble to life. Everyone we talked to who worked on the project gave us the same explanation. The basic idea was to create a great car that’s electric, not one whose only selling point is its battery. 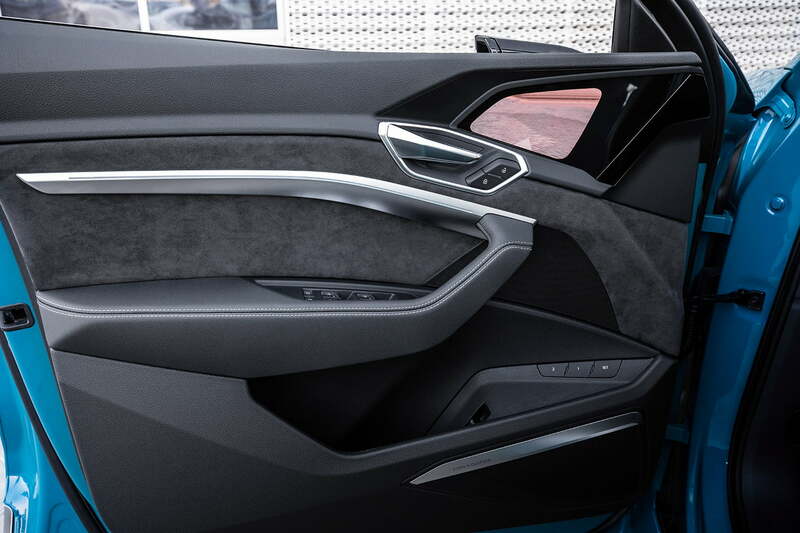 The E-Tron offers 57 cubic feet of trunk space. To add context, the Q5 boasts 53 cubes while the Q8 – Audi’s flagship SUV – checks in at 60.7. But, since there’s no engine, what’s under the hood? Pop it like you normally would to reveal a small but practical storage compartment to store the charging cables, or, depending on how tech-savvy the thieves in your area are, valuables. The frunk’s volume isn’t included in the 57-cubic-feet figure we mentioned above. Audi has never packed this many technology features into a car before. 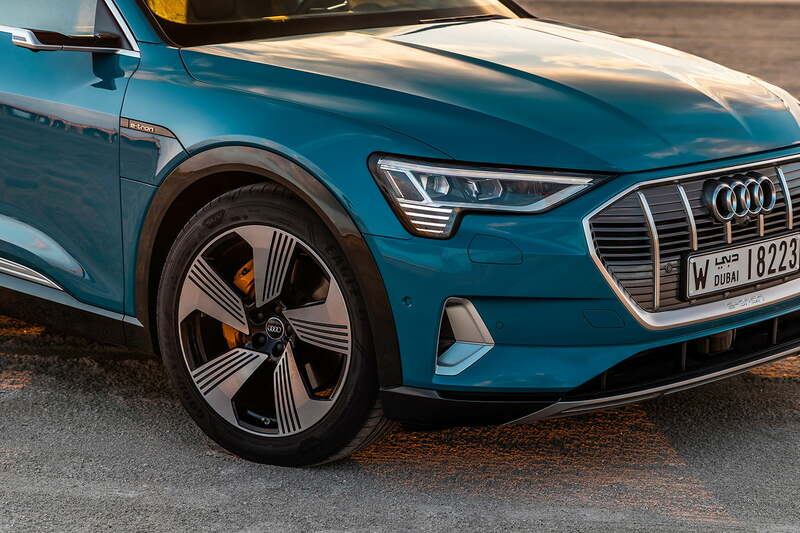 If a Q5 is a cheeseburger, the E-Tron is a double – wait, no, triple – cheeseburger topped with all the fixings, even some you’ve never thought of putting on a burger before. Let’s get the coolest one out of the way: the rear-view cameras. 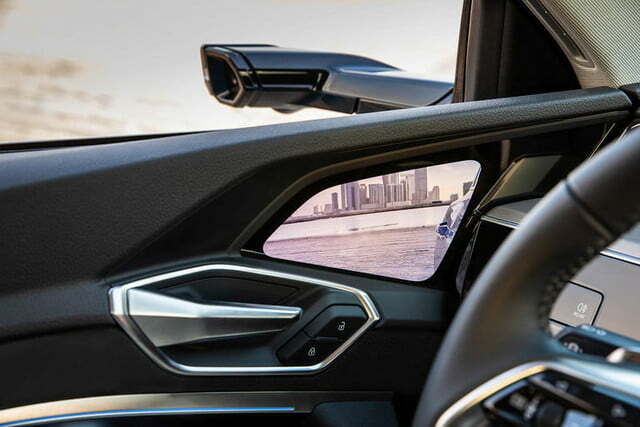 Instead of traditional mirrors, Audi installed tiny cameras mounted in rear-facing pods. They transfer the footage they capture to screens integrated into the door panels, where you’d normally expect to find a speaker. The driver-side screen is touch-sensitive, and it’s used to adjust the view on both sides. Though they take some getting used to, the cameras improve range by reducing drag and they make the E-Tron narrower. Unfortunately, they’re also illegal in the United States. Audi is working on getting permission to offer this forward-thinking feature on the U.S.-spec car, though it couldn’t provide a more specific time frame. Your next car might not have it, but the one after it very well could. The E-Tron shares its dual-screen MMI Touch Response infotainment system with other members of the Audi family, including the aforementioned Q8, the A6, and the A7. The latest Q3 uses a single-screen version of the system. It’s highly intuitive to use, it looks good, and it responds quickly to touch inputs. It’s our favorite infotainment system in the luxury car segment. There is a third screen behind the steering wheel that replaces the instrument cluster. Called Virtual Cockpit, it’s a driver-configurable unit that shows navigation directions, media settings, and information about the car and its surroundings. When the E-Tron is charging, it provides useful information like the charging speed and the battery’s current level of charge. We like this feature; it takes a lot of the guesswork out of driving an electric car. Plug it in, look at the screen, and you’ll know exactly when to come back for a full charge. The E-Tron delivers 408 horsepower and 489 pound-feet of torque when its overboost mode kicks in. What about the rest of the time? Proactively solving the infrastructure problem requires more than peppering America’s road network with charging stations. No one wants to sit on the side of I-80 for eight and a half hours, counting blue cars while waiting for watts to trickle into a giant battery. Audi went the extra mile, if you’ll allow us this oh-so-bad but oh-so-inevitable pun. The E-Tron is the first volume-produced electric car compatible with 150-kiloawtt charging, which is capable of zapping the battery with an 80-percent charge in 30 minutes. To put that figure into perspective, Tesla’s Supercharger stations top out at 120 kilowatts. And, of course, other (slower) types of charging are available, too. The E-Tron rides on a skateboard-like platform built around a 95-kWh lithium-ion battery pack that’s about as big as a king-size mattress. It channels its charge to two electric motors (one over each axle). An armada of on-board sensors share information and work together in real-time to decide how much torque each axle needs. Every process is electronic, there is no mechanical connection between the two axles, so the changes happen nearly instantaneously. If the front wheels slip, more power automatically goes to the rear, or vice versa. It’s the first fully electric application of Audi’s Quattro all-wheel drive system. The system provides 360 horsepower and 413 pound-feet of torque in normal driving conditions. These figures go up to 408 and 489, respectively, when a boost mode kicks in. The E-Tron isn’t light, it tips the scale at nearly 5,500 pounds, but it performs the zero-to-60-mph sprint in 5.7 seconds with the boost mode engaged. That’s a respectable statistic considering its size, segment, and mission. Here again, the E-Tron had to be normal. 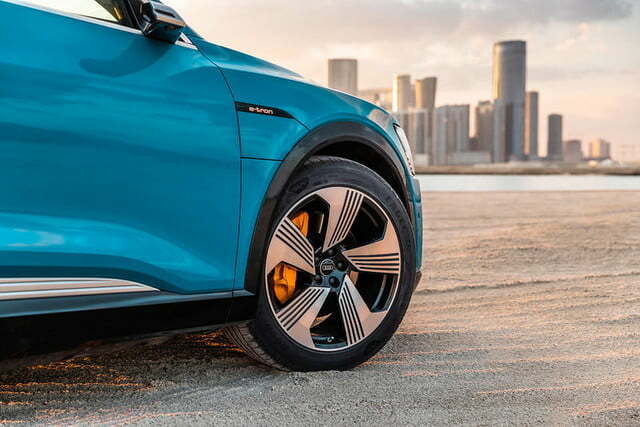 The members of Audi’s target audience don’t want a sub-three-second zero-to-60-mph time from an electric SUV, and they don’t need 600 miles of range from a single charge. There is nothing ludicrous about this car, if you catch our drift. It’s not radical. Sure, you’ll have to make some adjustments, like getting used to the fact that it doesn’t rumble to life, and remembering to use the shift paddles to adjust the regeneration, but if you’re coming from a Q5 you’ll mostly feel at home. Audi normally goes to great lengths to make its cars quiet, but the E-Tron takes it to the next level, even for an electric car. The lack of a gasoline engine makes it possible to use library-like voices to have a conversation while traveling at 100 mph, the speed limit on some stretches of highway in Abu Dhabi, where our test took place. Road noise is more noticeable than in a Q5, for example, but it’s not intrusive or bothersome. In this respect, the E-Tron feels nearly as refined as an A8. The E-Tron is better suited to cruising than carving. 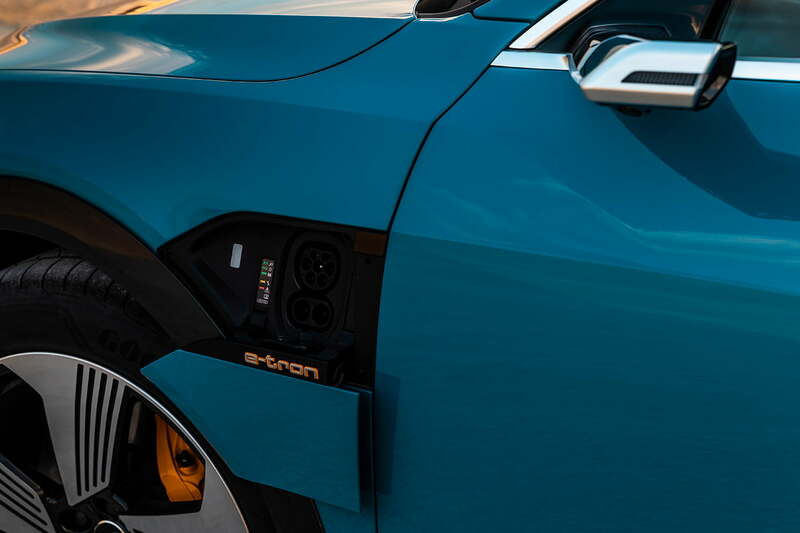 When you’re pulling away from a stop light, the instant torque provided by the electric motors overcomes the E-Tron’s not-insignificant weight to move it along at a brisk pace. 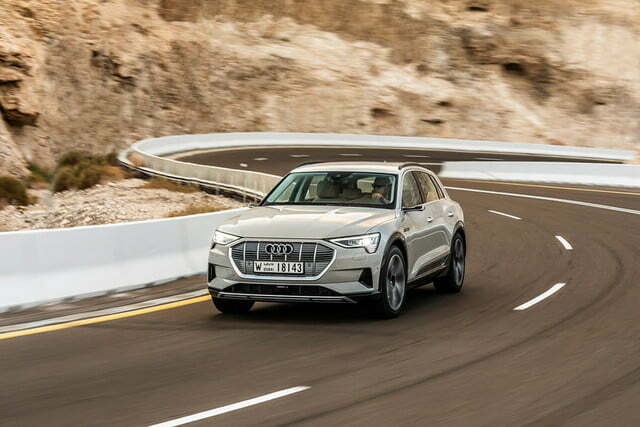 It’s not fast, Audi is saving that adjective for the upcoming E-Tron GT, but it’s quick enough for an SUV. There is no conventional transmission, and there’s no such thing as turbo lag in an electric car, so the E-Tron builds up speed in an even, linear manner. The air suspension stops bumps in the roads before they filter through the cabin. The lithium-ion battery pack is a double-edged sword. On one hand, it contributes nearly 1,600 pounds to the E-Tron’s weight. On the other hand, all of that weight is below the passenger compartment, which helps keep the center of gravity low. The E-Tron is better suited to cruising than carving, especially because its steering is light and not very communicative, but the battery pack helps it take a corner without an alarming amount of body lean. Speed junkies can rest assured the ESC has a sport mode. The E-Tron has another tech trick up its sleeve. When you press the brake pedal, you send a signal to a control unit that electronically distributes the brake force. That’s assuming the hydraulic system comes into play. Sometimes, the pads stay put and the brake energy recuperation system channels electricity back to the battery pack while slowing down the car. The E-Tron decides the best way to slow down on its own. The brake pedal feels the same regardless of whether or not the hydraulic system is being used because Audi fitted it with a simulator to preserve natural brake feel. This system eliminates some of the oddness associated with driving an electric car, especially around town. 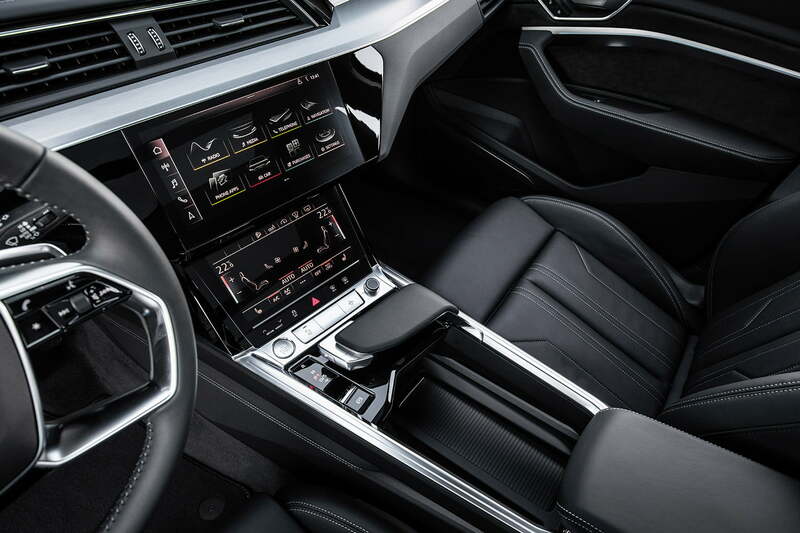 The seating position is comfortable, and all of the controls are where you would expect to find them, especially if you’re familiar with Audi’s recent models. The passengers sit on comfy chairs, and even the ones riding in the back enjoy an ample amount of space. Room is one of the undeniable benefits of a zero-emissions powertrain. Audi hasn’t released a range figure for the American-spec E-Tron yet, and our time behind the wheel was too short to measure how far it can drive on a single charge in real-world conditions. Your mileage may vary, anyways. The E-Tron learns each driver’s driving style and takes it into account when providing an estimate of how much range is left in the battery pack. With an equal charge, a driver with a lead foot will run out sooner than a hyper-miler, and the range readout in the instrument cluster reflects that. It’s like commuting in a car with a gasoline- or a diesel-burning engine. Range will also depend on which accessories (such as the heater and the air conditioning system) draw electricity. As of December 2018, the Audi E-Tron has two main rivals. – Jaguar I-Pace ($69,500). The Jaguar I-Pace and the Audi E-Tron exist at opposite ends of the electric SUV spectrum. The I-Pace’s design screams “I’m electric!” by breaking with tradition and blurring the lines that separate the wagon, hatchback, and SUV segments. It’s sportier to drive than the E-Tron, but it’s not as well-built inside. Audi’s infotainment is faster and more intuitive, too. – Tesla Model X ($84,000). Tesla’s Model X is closer in size to the Audi Q8 than to the E-Tron but the two overlap in several key areas, including pricing. While the Model X is quicker than the E-Tron, and we like its over-the-air updating system, it’s not as practical – it can’t take a roof rack, for example – and the Audi boasts a nicer interior. Note that Tesla will begin losing its federal tax credit on January 1, 2019. The segment will get very crowded, very fast. Mercedes-Benz will release the EQC in 2019, and BMW will arrive to the party fashionably late with the iX3 in 2020. Audi hasn’t released full warranty information about the 2019 E-Tron yet. We know the battery pack is covered by a warranty that guarantees at least 70 percent of the original capacity after eight years or 100,000 miles, whichever comes first. The pack’s design makes it possible to replace individual modules instead of the entire pack, which reduces maintenance costs. Every part of the E-Tron is brand-new so it’s difficult to predict how reliable it will be over the coming years. The E-Tron points the way forward in terms of electrification, design, and technology. The E-Tron protects its occupants with dual front, front side, and curtain airbags in addition to the usual traction and stability control systems. Side assist technology comes standard, while buyers who select the Prestige trim benefit from traffic sign recognition, active lane assist, and intersection assistant. These features are bundled in the driver assistance package and offered optionally on the base E-Tron. Both trim levels can receive rear side airbags at an extra cost. If we were spending our own money, we’d take full advantage of the $7,500 federal tax credit and get the top-spec Prestige for roughly the price of the Premium Plus. It’s well-equipped as-is, it covers all of the technology and comfort bases, but we’d spend the $650 Audi charges for a trailer hitch. 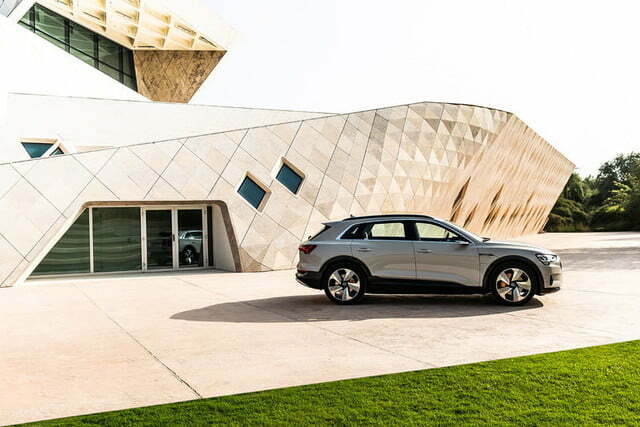 Audi chose to strike in the heart of the SUV segment by making the E-Tron as normal as possible. Buyers who simply want an electric car for the novelty of driving something that’s different will be rudely disappointed, but those seeking to ditch gasoline without sacrificing day-to-day comfort, usability, or familiarity will appreciate the E-Tron for what is: a luxurious, high-tech SUV that just happens to not have an engine.